How are New Homes Wired for Television, Phone, and Computer Networks? Communication and Entertainment Lines Ahoy! 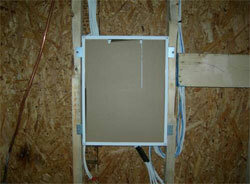 The Audio Visual Installer, Home Specialties, offered us several comprehensive pre-wiring packages for our entire home. We choose to have TV, Phone and Network cables pre-wired in almost every room of the house. We also opted to have an in-ceiling speaker system for the living room wired with its own volume control, as well as pre-wires for a set of speakers on the exterior of the house at the patio. The centerpiece of the installation is the conversion of the 5th bedroom / Den in to a full home theater room. Speaker terminals were run to all 4 corners of the room, as well as center for a center channel speaker. An in-wall subwoofer wire was also run to terminate where we plan to keep the Stereo Receiver and Disc Player. In addition to the speaker wiring, the crew installed a 110v power and HDMI cable in the ceiling at the rear of the room to facilitate a projector for big screen action. The theater room will also feature two cable TV lines for dual DVR (Digital Video Recorder) and Picture-in-picture from our satellite feed. A phone line and Cat5e Ethernet (computer network wire) is also installed to interface with the home network system and media server. All of the TV, Phone and Network wires terminate in the garage in a Leviton home frame� cabinet that mounts flush in the garage. This offers a central point for the satellite TV and the computer network / cable modem connection. With the advent of the information age, more and more gadgets and devices are introduced to the home. There was the television, and then came the telephone, and now most homes have very elaborate computer networks in them. In this regard, it is very important for you to have your home properly wired and networked so that you can properly use and maximize all your high technology gadgets and devices. You must consider this very important factor, especially when you have a new home. Actually, it is best to pre-wire your new home before it is finished. Installing additional wiring when your home is already finished can be more difficult as compared to completing the pre-wiring job while in the process of completing your home design. You will not have to do some drilling or hire additional help to install new circuits, wires and other necessary equipment that will also entail additional costs and hassle. Thus, if you think about it, pre-wiring your house is actually a lot cheaper and it is less of a hassle compared to having the wiring done eventually. Thus, you have to start laying down the factors to consider when pre-wiring a house before the construction of your house is carried out. This way, you can also hide the wiring perfectly so it will not affect the aesthetics of your house. In the same manner, planning and doing the pre-wiring in advance will help you wire and connect the gadgets and devices from each room in your house. To give you a heads up, many homeowners also prefer to have the television cable, phone cable, computer cables and other electrical cables entered at the same location. Then, this location becomes the hub for all the actual connections necessary in wiring your home. This will be the central location for the termination of all the cables so your wiring will be more organized. You must also make it a point to mount and rout all the cables in an organized way. Make sure that you have the installation done neatly. In this regard, you can label all the cables. As much as possible, indicate on the label the location where they were terminated so you can be properly guided. Another factor that you must know is that the wiring your home for television, phone as well as computer networks can be a pretty complicated. If you are knowledgeable and skilled when it comes to this task, then perhaps you can complete it yourself. On the other hand, if you do not have enough knowledge to wire your home, then you should leave the task to the experts. Otherwise, you may just cause more of a mess that will entail more costs, more hassle and a longer time before the actual task is completed. When choosing a company that will do the installation or pre-wiring, make sure that you find the ones that are fully experienced when it comes to the job. Find a reputable company that is properly accredited and registered. This way, you can stay away from the companies that give substandard service. Here is a hint: look for a company that is already well established. Remember, it will not last in the business if it does not render high quality performance and service. Make sure that the person you will hire from the company also has the necessary skills. As much as possible, ask for a license and certification, and even insurance to know his or her level of expertise. Wiring a home can be complicated, but it is necessary. If you are able to pre-wire while construction is taking place, you will be able to choose the location and rooms in which you want certain wires installed. While having wires installed, you may also want to consider adding a speaker system throughout the house. Just imagine enjoying music in every room of your home. This is a possibility, and pre-wiring makes it even more imaginable.